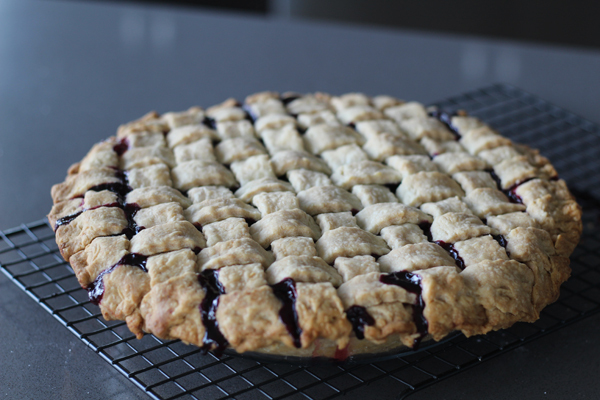 No matter how you slice it, this blueberry pie is delicious! Derrick Lingle from Granite Falls won 1st place with it at the North Carolina State Fair. Blue ribbon blueberry pie anyone? His easy to follow crust directions help ensure a lovely lattice crust. When you’re craving an amazing fruit pie, this is a go to recipe for sure. Enjoy! Bottom Crust: Pulse flour, sugar and salt in food processor to combine. Add butter and process until the mixture resembles coarse meal (about 10 seconds). While pulsing the food processor in 1 second increments, slowly add ice water in a steady stream through the feed tube. Continue to pulse until the dough starts to hold together (no longer than 30 seconds). Wrap dough in plastic and shape into a disc. Refrigerate at least 1 hour. Top Crust: Follow the same procedure as bottom crust, but divide the dough into two equal portions before wrapping and refrigerating. Assembly: Lightly grease a 9-inch pie pan with vegetable shortening. Roll out bottom crust dough disc on lightly floured surface until the diameter is roughly 13 inches (about ¼ inch thick). Transfer dough to 9-inch greased pie pan and allow the dough to rest into place. Lightly press the inside edges to form the dough into the pie pan. Refrigerate. Meanwhile, onto wax paper lightly dusted with flour, roll out top crust dough discs (separately) until each diameter is roughly 13 inches (about ¼ inch thick). Using a fluted pastry cutter, cut both discs into 1-inch vertical strips, keeping the circles in tact. Refrigerate while you prepare filling. Preheat oven to 350 degrees F while you prep the filling and lattice top. In a large bowl, combine sugar, cornstarch and salt in a large bowl. Add blueberries and lime juice. Toss to make sure all ingredients are mixed well with the blueberries. Pour on top of bottom crust, spreading the filling evenly. 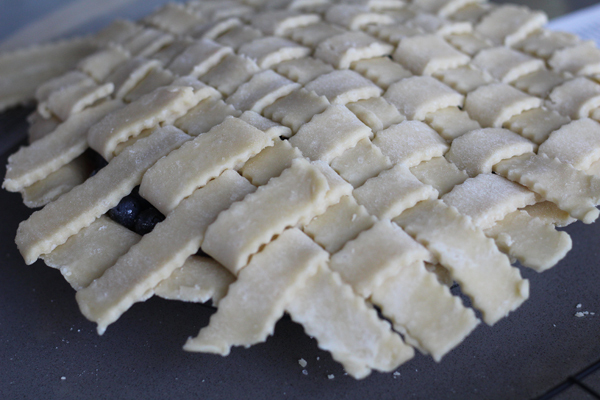 Lattice: Lay the strips from one circle of rolled out dough horizontally over the pie, using the longer strips in the middle of the pie and shorter strips toward the edges. Keep all strips close together. Fold every other strip back onto itself. Lay a strip from the second circle of dough vertically so it lays across the unfolded horizontal strips, keeping all the strips snug. Swap the folded and unfolded horizontal strips and add another vertical strip. Continue swapping the folded and unfolded horizontal strips and adding a new vertical strip each time. Keep repeating to “weave” all the strips and create a lattice pattern across the entire top. 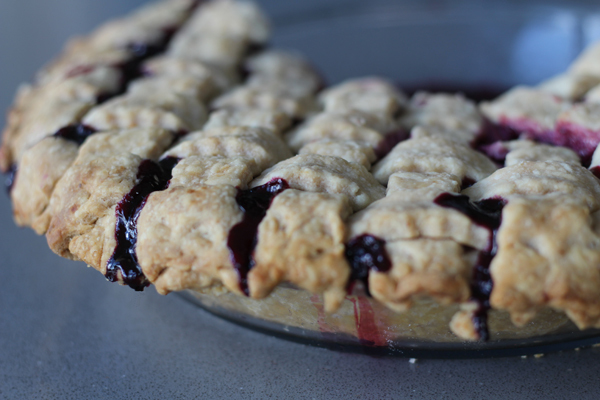 Cut the excess dough away from the pie’s edge crust, leaving a 1/4 inch overhang for crimping. Pinch the edge of the crust between your thumb and side of your index finger to flute the outside edge. Whisk 1 large egg with 1 teaspoon milk and brush on top of pie. Sprinkle with 2 tablespoons sugar. Place on rimmed baking sheet in center of oven and bake for 1 ½ hours or until golden brown. Let cool at least 6 hours before serving.